Sunday: 60 min treadmill, high incline & brisk pace. (I did this while reading a required book for work. Yay for multitasking! Tuesday: 70 min. stationary bike for warm up & Zumba! Thursday: 60 min at the gym – treadmill, ab & leg machines. Friday: 60 min Zumba tonight! 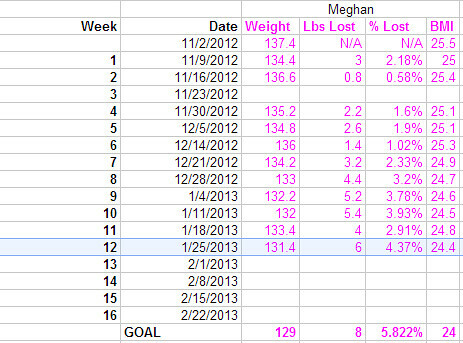 Week 12 Weigh-in: 131.4 Yay! I’m down .6 from Week 10 (we’re gonna forget Week 11 ever happened). BMI: 24.4. So excited to be in the green and move further away from the yellow danger zone! Clothing Size: 6. And I’ve been thinking… once I get to my goal weight, I’m going to try on my wedding dress. I’ll be 18lbs lighter than I was on my wedding day… it’ll be fun to see if it’s big on me! Eating & Drinking:Calorie Counting: Yep, I’ve jumped back on the train. I know it’s crunch time and I need to closely watch my calories in and out, so although it’s a pain to log it all, I’m determined to keep it up! If I want to keep to 1/2 a pound a week, I need to keep my calories to 1200/day. But on days I workout, I burn more calories and can thusly eat more, which makes sense because I’m starved after a workout! I’m thinking about trying protein shakes for after workouts. Suggestions/Thoughts? I’m using the FIT BIT to track cals & it’s working great. Well, honestly I was a bit frustrated day 1 (Tuesday) because I was eating small, healthy meals & snacks all day, but the calories just kept racking up. I had almost 900 calories when I left work and thought, good thing I’m going to Zumba tonight, cuz otherwise I wouldn’t have any calories for dinner! Now, don’t get me wrong, I’m not gonna starve myself. I’m just going to be conscious of what I’m putting in my body. Having to log everything makes you much much more aware of calories and what’s healthy and what’s not. For example, Tuesday I had chex cereal, which was 260 calories! Eek. So Monday, I had yummy cheerios (100 calories). And instead of a sandwich for lunch (the bread on that was 120 calories alone), I had a salad. Little choices like that and I’ll HOPEFULLY be shedding these last measly pounds! Seems to have worked this week! Sleeping: I have been averaging 7 hours a night, and Avery’s been sleeping thru, so that’s not bad. But the cold frigid weather just makes me want to stay under the covers longer every morning! Are you a Calorie Counter? Does it work for you? Do you just keep the numbers in your head, or do you use an app? oh that is so cool!!! much cheaper than getting it resized! Thanks for sharing. Good point you made too about when you hands swell up… mine swell up in the heat so I would hate to resize it and then not be able to get them off this summer. Thanks so much! haha… well knowing me I’m gonna get to my ideal weight and be super healthy and THHHHEEEN baby #2 can come. Then I can go the weightloss all over again! I am a calorie counter, it’s the only way to diet IMO. I just jot it down on a laptop post it and know most cals off top of head. It was harder at first, but now it’s becoming second nature… and logging everything isn’t that bad. It does make me very conscious of everything I eat. I love days I go to the gym best, because I burn more, and therefore I can eat more! You are doing a great job. I count calories too. In fact, I’m an avid calorie counter. I’ve been counting since 2003 but was more consistent since 2007 (i.e. not missing a day, not even my wedding/honeymoon/when I delivered the baby, LOL). 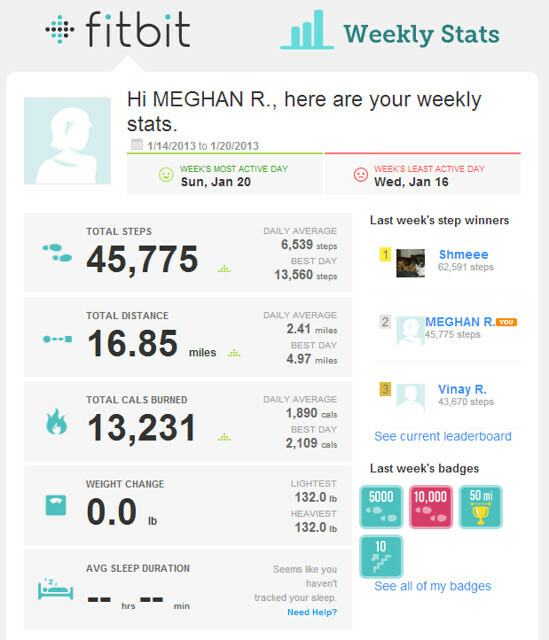 I am more laxed now with the calorie counting, but for the most part, I still log everything in. It really helped me lose weight in 2007. I’m only 4’11 and in 2006, when I met my husband and we started dating, I gained 20+ lbs. I went from 120 to 146. Calorie counting really kept me together — and it’s sad that i’m better at budgeting my calories than my bank book. My rings got really loose after Lili was born. It was to the point where if I raised my hand up, it would fling off. I didn’t end up getting them re-sized. Instead, I got a ring guard put on and they didn’t even charge me for that — but that’s because my sister works there. The ring guard can come right on. Just in case I gained more weight when I have another baby — plus, in the winter (and in the cold in general) my rings are always so much looser. Go to your jewelers and ask them about a ring guard. I think it costs like $5 or something. Thanks so much, Rachel. Someone else suggested the ring guard. I’d never heard of the before. I’ll have to get them! You went up 20lbs?! Wow. That’s how I feel about how I slowly gained weight after college. I think i was in the 120s in college… but I’m not looking to go that low (yet! )… maybe after running a marathon I’ll be that skinny again! Yes, look into getting them. I only have the guard on my engagement ring and on my bands, I keep on the inside. Girl, I couldn’t believe I blew up. I was denial until I saw a picture of myself that December 2006. By July 2007, I was 105 lbs. It was from calorie counting + I started to run — but it was way before running long distance. I was running maybe 3-6 miles 6 days a week and doing some strength. How do you like the app you use to calorie count? the app is OK. It’s the FITBIT app, so it tracks how many calories I burn in a day, I add my food, and it tells me if I’m under or over. It’s convenient, but some of the foods arent in there and it only logs cals, not other stuff like carbs and fiber, suger, etc. I’ve used MyFitnessPal before and that logged everything else, which was nice to see, but at this point, simple and convenient is best for me. It’s hard to remember to log everything when im at work then at home and chasing avery around. It was hardest over this weekend, but I stuck to it. I didn’t even go over when we went out for Vinay’s birthday Saturday night! Wow – you are focused. WIth that type of determination, I am sure you will reach your goal. Good luck. Awe, thanks Elske! What motivates you? Setting a goal? Looking forward to something? I have to set a goal for myself and blogging about it keeps me motivated since I have to report to the world. I’m sorry to hear about your knee, Elske. I’ve never had any fitness injuries, so I can’t relate. That must have been a tough set-back. But when the time is right, for you and your family, you’ll fit it back into your schedule. I ran 1 1/2 miles last night and it felt wonderful! Great stress relief and I feel so accomplished and good about myself after! This is the proper weblog for anyone who desires to find out about this topic. You realize so much its nearly exhausting to argue with you (not that I actually would want匟aHa). You positively put a brand new spin on a subject thats been written about for years. Nice stuff, just great! I just want to tell you that I’m very new to blogs and absolutely loved your web blog. Probably I’m want to bookmark your blog . You surely come with awesome articles and reviews. Thanks for sharing with us your website page. Aw, this was a really nice post. In idea I want to put in writing like this additionally ?taking time and actual effort to make a very good article?but what can I say?I procrastinate alot and in no way appear to get something done. I simply want to say I’m very new to blogging and certainly savored your blog site. More than likely I’m planning to bookmark your website . You amazingly come with wonderful articles and reviews. Many thanks for sharing your blog. I simply want to tell you that I’m very new to blogging and site-building and honestly loved you’re blog site. Most likely I’m likely to bookmark your website . You actually come with really good articles. Thanks a bunch for revealing your webpage. I just want to mention I am new to blogging and truly savored you’re blog site. Very likely I’m planning to bookmark your website . You certainly come with amazing stories. Appreciate it for revealing your web page. I just want to tell you that I am very new to blogging and site-building and definitely savored your blog. Very likely I’m planning to bookmark your site . You amazingly have really good articles. Cheers for sharing your webpage. I simply want to say I am just new to blogs and certainly savored this page. Very likely I’m want to bookmark your website . You amazingly have outstanding well written articles. Thank you for sharing with us your web-site. I simply want to say I am just new to blogging and site-building and seriously savored your blog. More than likely I’m going to bookmark your blog post . You certainly have good articles. Bless you for sharing with us your blog. I would like to show my admiration for your kind-heartedness supporting visitors who have the need for guidance on the niche. Your personal dedication to getting the message throughout appeared to be rather interesting and have in every case enabled employees just like me to attain their ambitions. Your own important advice denotes this much a person like me and substantially more to my mates. Many thanks; from all of us. I just want to say I’m beginner to blogging and actually liked this page. Probably I’m going to bookmark your site . You amazingly have awesome article content. Many thanks for sharing your web-site. I just want to mention I’m very new to blogging and site-building and really liked your web blog. Probably I’m likely to bookmark your website . You amazingly have good stories. Bless you for revealing your web-site. My husband and i felt really fulfilled when Chris could finish up his investigation through the entire ideas he grabbed from your own weblog. It is now and again perplexing to just possibly be handing out tips that many other folks may have been selling. And we discover we need the writer to thank for that. Most of the explanations you have made, the easy blog menu, the friendships your site make it possible to instill – it’s got everything great, and it’s really aiding our son and the family know that the theme is brilliant, and that is quite vital. Many thanks for all the pieces! I simply want to tell you that I am just new to blogging and site-building and absolutely liked you’re website. Probably I’m want to bookmark your website . You definitely have remarkable articles and reviews. Bless you for sharing with us your webpage. hey there and thank you for your information – I’ve definitely picked up anything new from right here. I did however expertise some technical points using this website, since I experienced to reload the site many times previous to I could get it to load properly. I had been wondering if your hosting is OK? Not that I am complaining, but sluggish loading instances times will often affect your placement in google and can damage your quality score if ads and marketing with Adwords. Anyway I’m adding this RSS to my email and could look out for much more of your respective intriguing content. Ensure that you update this again very soon..
Whats Taking place i’m new to this, I stumbled upon this I’ve discovered It absolutely helpful and it has helped me out loads. I’m hoping to contribute & aid other customers like its helped me. Good job. I do believe all the ideas you’ve introduced in your post. They’re very convincing and will certainly work. Nonetheless, the posts are very short for novices. May you please lengthen them a bit from next time? Thanks for the post. What a lovely blog. Iâ€™ll surely be back once again. Please preserve writing! I believe you might have noted some really fascinating details , appreciate it for the post. I simply wanted to thank you very much once more. I am not sure the things I could possibly have worked on in the absence of the ideas contributed by you about such question. It truly was an absolute horrifying crisis for me, however , looking at your well-written way you managed the issue took me to jump with fulfillment. Now i’m grateful for the help and as well , hope that you comprehend what a great job that you are carrying out instructing many others all through your webpage. I’m certain you haven’t come across any of us. You can certainly see your enthusiasm within the paintings you write. The sector hopes for more passionate writers like you who aren’t afraid to say how they believe. All the time follow your heart. “Until you walk a mile in another man’s moccasins you can’t imagine the smell.” by Robert Byrne. Youâ€™d superb suggestions there. I did a research about the concern and identified that likely almost anyone will agree with your internet page. I see you’re into weight lifting as properly! You must look at my blog, and other men and women articles! Beneficial info and outstanding design you got here! I want to thank you for sharing your tips and putting the time into the stuff you publish! Great function! Thanks a lot for sharing this with all of us you really recognize what you are talking about! Bookmarked. Please also talk over with my web site =). We could have a link alternate agreement among us! I definitely wanted to write a small word to appreciate you for the magnificent hints you are giving at this site. My extended internet search has finally been paid with beneficial facts and strategies to exchange with my two friends. I ‘d assert that many of us visitors actually are undoubtedly endowed to exist in a really good site with so many wonderful people with beneficial techniques. I feel rather privileged to have seen your entire web pages and look forward to some more thrilling minutes reading here. Thanks a lot once again for a lot of things. Glorious weblog! I actually enjoy how itâ€™s simple on my eyes in addition to the details are properly written. I’m wondering how I may be notified every time a brand new post has been created. I have subscribed to your rss feed which must do the trick! Have a good day! ???? I¡¦ll right away grab your rss feed as I can’t find your email subscription link or e-newsletter service. Do you’ve any? Please let me understand so that I could subscribe. Thanks. Extremely very good written post. It is going to be helpful to anybody who usess it, including myself. Keep up the good function – canâ€™r wait to read more posts. Excellent goods from you, man. I’ve understand your stuff previous to and you’re just too wonderful. I really like what you’ve acquired here, certainly like what you are saying and the way in which you say it. You make it entertaining and you still care for to keep it sensible. I can’t wait to read far more from you. This is actually a terrific web site. Generally I don’t read post on blogs, however I wish to say that this write-up very forced me to take a look at and do so! Your writing taste has been amazed me. Thank you, very nice article. I¡¦ll right away grasp your rss as I can’t in finding your e-mail subscription hyperlink or newsletter service. Do you have any? Please allow me recognize in order that I may subscribe. Thanks. Cheers for this excellent. I was wondering should you were thining of writing related posts to this 1. .Keep up the great articles! Some truly select articles on this internet web site , bookmarked . I got what you mean , saved to my bookmarks , quite good internet site . I simply wanted to say thanks once again. I’m not certain the things that I would have used without those tricks shown by you on this question. It was a real distressing crisis in my opinion, nevertheless taking note of the very well-written form you dealt with that took me to leap with gladness. I will be happy for this advice and in addition have high hopes you know what a powerful job you were providing educating the mediocre ones via your web page. Most probably you have never got to know any of us. Thanks a bunch for sharing this with all folks you really know what you are talking approximately! Bookmarked. Please also visit my site =). We could have a hyperlink exchange contract among us! I do agree with all the ideas you have introduced on your post. They are really convincing and can certainly work. Still, the posts are too quick for starters. May just you please lengthen them a little from next time? Thank you for the post. I would like to get across my affection for your kindness supporting those individuals that absolutely need help on this important matter. Your real dedication to getting the message along appears to be really good and has truly empowered those much like me to attain their ambitions. Your own informative tutorial entails much a person like me and further more to my mates. Warm regards; from everyone of us. As I internet internet site possessor I believe the content material matter here is rattling magnificent , appreciate it for your hard work. You should maintain it up forever! Very best of luck. What i don’t realize is actually how you are not really much more neatly-favored than you may be right now. You are so intelligent. You already know thus considerably with regards to this matter, made me in my view imagine it from a lot of numerous angles. Its like men and women aren’t fascinated until it is one thing to do with Woman gaga! Your personal stuffs outstanding. All the time deal with it up! hello!,I love your writing so a lot! proportion we keep up a correspondence more about your post on AOL? I need an expert on this house to solve my problem. May be that is you! Taking a look ahead to peer you. Thanks , I’ve just been looking for information about this subject for ages and yours is the best I have came upon till now. However, what concerning the bottom line? Are you positive in regards to the supply? I was seeking at some of your articles on this web site and I believe this internet internet site is genuinely instructive! Maintain on posting . Excellent goods from you, man. I have understand your stuff previous to and you’re just extremely magnificent. I actually like what you’ve acquired here, really like what you are stating and the way in which you say it. You make it enjoyable and you still care for to keep it wise. I can not wait to read much more from you. This is really a wonderful website. fantastic put up, very informative. I ponder why the other specialists of this sector don’t understand this. You must proceed your writing. I am confident, you have a great readers’ base already! I added this article to my favorites and plan to return to digest a lot more soon. Itâ€™s effortless to read and comprehend as nicely as intelligent. I truly enjoyed my first read by way of of this write-up. Hi there, I must say that Tales from abroad Â» Blog Archive Â» Rafting is actually a incredibly exceptional spot to slack from function I really actually like your weblog and Iâ€™ve already bookmarked it. Make certain you, preserve it up to date considerably more often. Thank you! Hiya, I am really glad I’ve found this information. Today bloggers publish only about gossips and internet and this is really irritating. A good blog with interesting content, this is what I need. Thanks for keeping this web site, I will be visiting it. Do you do newsletters? Can not find it. Whats Going down i am new to this, I stumbled upon this I’ve discovered It absolutely useful and it has aided me out loads. I’m hoping to contribute & help other customers like its helped me. Good job. Very efficiently written post. It will be valuable to anybody who employess it, including myself. Keep up the good work – for sure i will check out more posts. Great tremendous issues here. I am very happy to see your post. Thanks a lot and i am taking a look ahead to contact you. Will you kindly drop me a mail? Extremely intriguing points you have observed , thanks for posting . I keep listening to the news update lecture about receiving free of charge online grant applications so I’ve been searching about for the best internet site to get one. Could you advise me please, where could i get some? of course like your web-site nevertheless you require to check the spelling on quite a couple of of your posts. Several them are rife with spelling issues and I to uncover it very bothersome to inform the reality nevertheless Iâ€™ll surely come back again. Hiya, I am really glad I have found this info. Today bloggers publish only about gossips and internet and this is really irritating. A good website with exciting content, that’s what I need. Thanks for keeping this web-site, I will be visiting it. Do you do newsletters? Can not find it. Hiya, I am really glad I have found this information. Nowadays bloggers publish only about gossips and internet and this is actually frustrating. A good web site with interesting content, this is what I need. Thanks for keeping this web-site, I’ll be visiting it. Do you do newsletters? Cant find it. of course like your website however you have to take a look at the spelling on quite a few of your posts. A number of them are rife with spelling problems and I find it very bothersome to inform the truth however I¡¦ll certainly come again again. What i do not understood is actually how you are not actually much more neatly-preferred than you may be right now. You are so intelligent. You already know thus considerably when it comes to this matter, made me for my part believe it from so many numerous angles. Its like men and women aren’t interested until it is one thing to do with Girl gaga! Your own stuffs outstanding. At all times handle it up! I have been browsing online greater than 3 hours lately, but I by no means discovered any fascinating article like yours. It¡¦s lovely value enough for me. Personally, if all site owners and bloggers made excellent content as you probably did, the internet shall be a lot more useful than ever before. I and also my pals ended up reviewing the nice tips and tricks on your web site and so at once got an awful suspicion I had not expressed respect to the site owner for those tips. These young men happened to be consequently stimulated to read them and now have without a doubt been making the most of them. Appreciate your being well helpful as well as for finding this form of important ideas millions of individuals are really needing to discover. Our own sincere apologies for not expressing appreciation to sooner. I appreciate you taking the time to create this post. It has been truly valuable to me surely. Value it. Whats Going down i’m new to this, I stumbled upon this I have found It positively helpful and it has helped me out loads. I hope to contribute & assist other customers like its helped me. Good job. A person necessarily lend a hand to make critically articles I would state. This is the very first time I frequented your web page and thus far? I amazed with the research you made to make this actual put up extraordinary. Fantastic task! Thank you, I’ve recently been searching for information approximately this subject for a long time and yours is the best I have came upon so far. However, what in regards to the bottom line? Are you certain about the source? Wow, amazing weblog format! How long have you ever been running a blog for? you made running a blog look easy. The full look of your web site is fantastic, let alone the content material! I will immediately clutch your rss feed as I can not find your e-mail subscription link or e-newsletter service. Do you’ve any? Kindly allow me know so that I may just subscribe. Thanks. I’ve been browsing online greater than three hours today, but I never found any interesting article like yours. It¡¦s pretty worth enough for me. Personally, if all webmasters and bloggers made good content material as you did, the web will likely be much more useful than ever before. I do believe all of the concepts you have offered on your post. They’re very convincing and will certainly work. Still, the posts are too brief for starters. Could you please lengthen them a little from next time? Thanks for the post. magnificent put up, very informative. I wonder why the other specialists of this sector do not realize this. You should continue your writing. I am confident, you have a huge readers’ base already! Simply desire to say your article is as surprising. The clarity in your post is just spectacular and i could assume you are an expert on this subject. Fine with your permission allow me to grab your feed to keep up to date with forthcoming post. Thanks a million and please carry on the rewarding work. wonderful put up, very informative. I’m wondering why the other specialists of this sector don’t notice this. You should proceed your writing. I’m confident, you’ve a great readers’ base already! I¡¦ve been exploring for a bit for any high quality articles or weblog posts on this sort of space . Exploring in Yahoo I finally stumbled upon this website. Studying this info So i am satisfied to convey that I’ve an incredibly good uncanny feeling I discovered just what I needed. I so much indisputably will make sure to do not put out of your mind this site and provides it a glance on a constant basis. I would like to point out my admiration for your kind-heartedness for men who absolutely need help on this important study. Your real dedication to passing the message all-around had become definitely good and have surely permitted others like me to get to their goals. This invaluable report means a whole lot a person like me and additionally to my peers. Regards; from everyone of us. Generally I do not read article on blogs, however I would like to say that this write-up very compelled me to try and do so! Your writing style has been amazed me. Thank you, quite nice post. Whats Happening i am new to this, I stumbled upon this I have found It positively helpful and it has helped me out loads. I’m hoping to contribute & assist different customers like its helped me. Good job. Great goods from you, man. I’ve understand your stuff previous to and you’re just too magnificent. I actually like what you’ve acquired here, really like what you are stating and the way in which you say it. You make it entertaining and you still care for to keep it wise. I can not wait to read far more from you. This is actually a wonderful web site. I am normally to blogging and i genuinely appreciate your internet site content material. This content has actually peaks my interest. I am going to bookmark your internet internet site and maintain checking choosing info. Deference to site author , some excellent entropy. Great tremendous issues here. I¡¦m very happy to look your article. Thanks a lot and i am having a look ahead to contact you. Will you please drop me a e-mail? Somebody necessarily assist to make seriously posts I would state. That is the very first time I frequented your web page and so far? I surprised with the research you made to make this particular publish incredible. Wonderful task! I¡¦m no longer certain the place you’re getting your info, but good topic. I needs to spend a while studying more or working out more. Thank you for excellent information I used to be on the lookout for this information for my mission. you are in point of fact a excellent webmaster. The site loading speed is incredible. It kind of feels that you are doing any unique trick. In addition, The contents are masterpiece. you have done a magnificent process on this topic! hey there and thank you for your information – I’ve definitely picked up something new from right here. I did however expertise a few technical issues using this site, since I experienced to reload the website a lot of times previous to I could get it to load properly. I had been wondering if your web host is OK? Not that I am complaining, but slow loading instances times will often affect your placement in google and could damage your high quality score if advertising and marketing with Adwords. Well I’m adding this RSS to my email and can look out for a lot more of your respective fascinating content. Ensure that you update this again very soon..
Hi there, I discovered your web site by way of Google even though searching for a related subject, your web site came up, it looks excellent. I’ve bookmarked it in my google bookmarks. Thanks so much for giving everyone such a breathtaking opportunity to read articles and blog posts from this web site. It is always very fantastic and jam-packed with a great time for me and my office friends to search the blog at minimum three times per week to study the newest guides you have got. Of course, I’m so certainly contented with all the powerful tips you give. Selected 2 points on this page are certainly the most suitable we have had. Simply want to say your article is as astounding. The clarity in your post is simply nice and i could assume you’re an expert on this subject. Well with your permission allow me to grab your feed to keep up to date with forthcoming post. Thanks a million and please carry on the enjoyable work. hi!,I like your writing so so much! percentage we communicate extra about your article on AOL? I need an expert on this space to unravel my problem. May be that’s you! Looking ahead to peer you. hello there and thank you for your information – I’ve certainly picked up something new from right here. I did however expertise several technical points using this website, since I experienced to reload the web site lots of times previous to I could get it to load properly. I had been wondering if your web hosting is OK? Not that I’m complaining, but slow loading instances times will very frequently affect your placement in google and could damage your high-quality score if ads and marketing with Adwords. Anyway I am adding this RSS to my email and can look out for much more of your respective fascinating content. Make sure you update this again very soon..
You completed certain good points there. I did a search on the subject and found a good number of people will have the same opinion with your blog. I want seeking at and I believe this website got some truly beneficial stuff on it! . I want to show my respect for your kind-heartedness for folks that must have help on that question. Your special commitment to getting the message up and down had become really interesting and has usually helped others much like me to realize their ambitions. Your warm and helpful information indicates a lot to me and far more to my fellow workers. Regards; from all of us. I was just looking for this info for a while. After six hours of continuous Googleing, finally I got it in your website. I wonder what is the lack of Google strategy that don’t rank this kind of informative web sites in top of the list. Usually the top web sites are full of garbage. I simply had to thank you very much once again. I am not sure the things I could possibly have followed without the actual points discussed by you on my area. It actually was a very distressing setting in my circumstances, however , seeing the very professional style you managed the issue forced me to cry over gladness. I’m thankful for your help and even hope that you recognize what a great job you’re accomplishing teaching many people via your blog post. I am sure you haven’t got to know any of us. I’ve been browsing online more than three hours nowadays, yet I never found any interesting article like yours. It is lovely worth sufficient for me. In my view, if all site owners and bloggers made good content as you probably did, the web will probably be a lot more useful than ever before. You really make it seem so easy together with your presentation however I in finding this topic to be actually something that I think I would by no means understand. It kind of feels too complicated and extremely vast for me. I’m having a look ahead to your subsequent publish, I will attempt to get the dangle of it! I¡¦m now not positive where you’re getting your info, however good topic. I must spend a while studying more or working out more. Thanks for excellent information I was on the lookout for this information for my mission. Great ¡V I should certainly pronounce, impressed with your website. I had no trouble navigating through all the tabs and related info ended up being truly easy to do to access. I recently found what I hoped for before you know it in the least. Quite unusual. Is likely to appreciate it for those who add forums or something, site theme . a tones way for your client to communicate. Nice task.. I simply wanted to appreciate you yet again. I’m not certain the things that I could possibly have created without the entire methods contributed by you on this industry. It became a scary matter in my position, but encountering your specialized strategy you managed that made me to weep with delight. I’m grateful for your service and then expect you really know what a great job that you’re undertaking instructing other individuals through your webblog. Most likely you haven’t come across all of us. I simply wished to say thanks again. I’m not certain the things I would have worked on without those advice contributed by you relating to this area of interest. It was actually a frightful problem in my view, but understanding your professional form you managed that forced me to jump over happiness. Now i am happier for your help and then trust you find out what a powerful job you happen to be providing educating most people through the use of your blog post. I know that you haven’t met any of us. You really make it seem so easy along with your presentation however I find this topic to be actually something that I feel I would never understand. It seems too complex and very large for me. I’m taking a look forward in your subsequent publish, I will try to get the hang of it! I¡¦ll right away clutch your rss as I can’t to find your email subscription hyperlink or e-newsletter service. Do you have any? Kindly let me know so that I may subscribe. Thanks. I¡¦m not sure where you are getting your info, however great topic. I needs to spend a while studying much more or working out more. Thanks for excellent info I used to be looking for this info for my mission. Thank you a bunch for sharing this with all people you actually recognise what you’re speaking approximately! Bookmarked. Kindly additionally visit my web site =). We will have a link change contract between us! Hiya very nice blog!! Man .. Excellent .. Superb .. I will bookmark your web site and take the feeds also¡KI’m satisfied to search out a lot of useful info right here in the submit, we want work out more strategies on this regard, thanks for sharing. . . . . . I have been surfing on-line more than 3 hours lately, but I never discovered any attention-grabbing article like yours. It is beautiful worth enough for me. In my opinion, if all webmasters and bloggers made just right content as you probably did, the web will likely be a lot more helpful than ever before. Great tremendous issues here. I¡¦m very glad to peer your article. Thanks a lot and i’m having a look ahead to touch you. Will you kindly drop me a mail? I and also my guys ended up looking at the nice tricks found on your web page then at once I had an awful feeling I had not expressed respect to you for those techniques. My women are actually for this reason very interested to study all of them and have in effect pretty much been loving those things. Thank you for simply being really accommodating as well as for opting for variety of incredibly good subjects millions of individuals are really needing to understand about. Our own honest apologies for not expressing appreciation to you earlier. I have been exploring for a bit for any high-quality articles or weblog posts on this sort of space . Exploring in Yahoo I finally stumbled upon this web site. Studying this information So i am glad to convey that I have an incredibly excellent uncanny feeling I found out just what I needed. I such a lot no doubt will make certain to don¡¦t disregard this web site and give it a glance on a constant basis. I and also my pals were analyzing the great advice on your web page then before long came up with a terrible suspicion I had not thanked the blog owner for them. Most of the people were definitely consequently very interested to read all of them and already have simply been taking advantage of these things. We appreciate you really being quite accommodating and also for deciding upon some excellent information millions of individuals are really needing to be aware of. Our sincere apologies for not saying thanks to you sooner. you are truly a good webmaster. The website loading speed is incredible. It sort of feels that you are doing any distinctive trick. In addition, The contents are masterwork. you have done a excellent process on this subject! hey there and thank you for your information – I’ve definitely picked up anything new from right here. I did however expertise several technical points using this site, since I experienced to reload the web site many times previous to I could get it to load properly. I had been wondering if your web hosting is OK? Not that I’m complaining, but slow loading instances times will sometimes affect your placement in google and can damage your high-quality score if advertising and marketing with Adwords. Well I’m adding this RSS to my email and can look out for a lot more of your respective fascinating content. Ensure that you update this again soon..
I¡¦ll right away grasp your rss feed as I can’t find your e-mail subscription link or newsletter service. Do you have any? Kindly permit me understand so that I may subscribe. Thanks. Thanks for any other informative website. Where else may just I am getting that type of information written in such an ideal method? I have a undertaking that I’m just now running on, and I have been at the look out for such info. Excellent website. Plenty of helpful info here. I am sending it to a few buddies ans additionally sharing in delicious. And obviously, thank you for your sweat! I have been surfing online more than three hours today, yet I by no means found any attention-grabbing article like yours. It¡¦s pretty price sufficient for me. In my opinion, if all web owners and bloggers made just right content material as you probably did, the internet can be much more helpful than ever before. I’m commenting to make you know of the nice discovery my girl gained going through your webblog. She figured out so many issues, with the inclusion of what it’s like to have a very effective coaching mindset to get the others just learn various impossible topics. You truly surpassed people’s expected results. Thanks for imparting these warm and friendly, healthy, revealing as well as unique tips on that topic to Jane. Thank you a bunch for sharing this with all people you actually know what you are speaking approximately! Bookmarked. Kindly additionally talk over with my website =). We could have a hyperlink change contract between us! I do trust all the concepts you have offered for your post. They are very convincing and will definitely work. Still, the posts are very short for beginners. Could you please lengthen them a little from subsequent time? Thank you for the post. I have learn some just right stuff here. Definitely price bookmarking for revisiting. I wonder how a lot effort you put to create this sort of wonderful informative website. great issues altogether, you just won a new reader. What might you suggest in regards to your post that you made some days in the past? Any sure? I am not certain where you’re getting your info, but good topic. I must spend some time studying much more or understanding more. Thanks for great information I was on the lookout for this information for my mission. Great goods from you, man. I’ve understand your stuff previous to and you’re just too fantastic. I really like what you’ve acquired here, certainly like what you’re stating and the way in which you say it. You make it enjoyable and you still take care of to keep it smart. I can’t wait to read far more from you. This is really a terrific web site. Terrific beliefs you’ve got here.. So happy to have found this publish.. Isn’t it superb when you uncover a good publish? Good views you possess here.. I was just searching for this information for some time. After six hours of continuous Googleing, finally I got it in your web site. I wonder what is the lack of Google strategy that don’t rank this kind of informative sites in top of the list. Normally the top websites are full of garbage. obviously like your web-site however you have to check the spelling on quite a few of your posts. A number of them are rife with spelling issues and I in finding it very bothersome to inform the reality however I¡¦ll definitely come again again. You really make it seem really easy together with your presentation but I in finding this topic to be really one thing that I believe I would by no means understand. It kind of feels too complicated and extremely huge for me. I’m looking forward for your subsequent submit, I will try to get the hold of it! Have you ever thought about creating an e-book or guest authoring on other websites? I have a blog based upon on the same information you discuss and would love to have you share some stories/information. I know my audience would value your work. If you are even remotely interested, feel free to send me an e mail. Very good site you have here but I was wanting to know if you knew of any discussion boards that cover the same topics talked about in this article? I’d really love to be a part of community where I can get suggestions from other experienced people that share the same interest. If you have any suggestions, please let me know. Thank you! Hi there would you mind letting me know which web host you’re utilizing? I’ve loaded your blog in 3 completely different web browsers and I must say this blog loads a lot quicker then most. Can you recommend a good web hosting provider at a honest price? Many thanks, I appreciate it! Have you ever considered about including a little bit more than just your articles? I mean, what you say is fundamental and all. But just imagine if you added some great graphics or video clips to give your posts more, “pop”! Your content is excellent but with pics and clips, this site could undeniably be one of the best in its field. Wonderful blog! Hello, Neat post. There is an issue together with your web site in internet explorer, could test this¡K IE still is the market leader and a large component of folks will miss your fantastic writing due to this problem. Thank you so much for giving everyone an exceptionally pleasant opportunity to read in detail from here. It can be very awesome plus packed with fun for me and my office mates to visit your website minimum 3 times in a week to read through the new items you have. Not to mention, I’m also actually satisfied with your effective principles you give. Certain two tips in this posting are without a doubt the finest I have had. I am not certain the place you are getting your info, but good topic. I needs to spend some time studying much more or understanding more. Thank you for excellent information I was on the lookout for this information for my mission. Hi there! Someone in my Myspace group shared this website with us so I came to take a look. I’m definitely loving the information. I’m book-marking and will be tweeting this to my followers! Fantastic blog and superb style and design. First off I want to say wonderful blog! I had a quick question which I’d like to ask if you do not mind. I was curious to find out how you center yourself and clear your mind before writing. I have had a tough time clearing my mind in getting my thoughts out there. I do take pleasure in writing but it just seems like the first 10 to 15 minutes tend to be lost just trying to figure out how to begin. Any ideas or tips? Thanks! I want to show appreciation to you for bailing me out of this type of difficulty. Just after looking throughout the search engines and obtaining recommendations which were not pleasant, I assumed my life was done. Being alive without the approaches to the problems you’ve resolved all through your main write-up is a critical case, as well as ones that would have adversely damaged my entire career if I hadn’t encountered your blog post. Your good knowledge and kindness in controlling every part was priceless. I don’t know what I would’ve done if I had not discovered such a thing like this. I can also at this moment look ahead to my future. Thanks very much for this impressive and effective guide. I will not think twice to endorse the blog to anybody who would like assistance about this problem. Very good site you have here but I was wondering if you knew of any user discussion forums that cover the same topics talked about here? I’d really like to be a part of online community where I can get comments from other knowledgeable individuals that share the same interest. If you have any recommendations, please let me know. Bless you! Thanks , I have recently been looking for information about this subject for a long time and yours is the best I’ve came upon till now. However, what in regards to the bottom line? Are you sure in regards to the supply? I would gipelris also love to add that when you do not actually have an insurance policy or maybe you do not remain in any group insurance, you will well gain from seeking the help of a health agent. Self-employed or individuals with medical conditions typically seek the help of one health insurance dealer. Thanks for your post. Awesome website you have here but I was curious about if you knew of any discussion boards that cover the same topics discussed in this article? I’d really like to be a part of group where I can get feedback from other knowledgeable people that share the same interest. If you have any recommendations, please let me know. Appreciate it! Hi there! Someone in my Myspace group shared this site with us so I came to give it a look. I’m definitely loving the information. I’m bookmarking and will be tweeting this to my followers! Exceptional blog and outstanding style and design. I am commenting to let you know of the extraordinary encounter our girl experienced reading through your blog. She mastered so many issues, including how it is like to possess an excellent giving mindset to have other people very easily learn about several complicated things. You undoubtedly surpassed my expected results. Many thanks for displaying such beneficial, safe, revealing and easy thoughts on your topic to Lizeth. Thanks for the marvelous posting! I truly enjoyed reading it, you might be a great author.I will make sure to bookmark your blog and will come back sometime soon. I want to encourage that you continue your great work, have a nice afternoon! It’s a pity you don’t have a donate button! I’d certainly donate to this fantastic blog! I suppose for now i’ll settle for book-marking and adding your RSS feed to my Google account. I look forward to new updates and will share this blog with my Facebook group. Chat soon! Have you ever thought about including a little bit more than just your articles? I mean, what you say is fundamental and everything. But think about if you added some great visuals or videos to give your posts more, “pop”! Your content is excellent but with pics and video clips, this site could definitely be one of the greatest in its niche. Terrific blog! F*ckin’ tremendous things here. I’m very satisfied to look your post. Thank you so much and i’m having a look ahead to touch you. Will you please drop me a mail? I like what you guys tend to be up too. This sort of clever work and coverage! Keep up the fantastic works guys I’ve included you guys to blogroll. Greetings from Los angeles! I’m bored to tears at work so I decided to browse your blog on my iphone during lunch break. I enjoy the information you provide here and can’t wait to take a look when I get home. I’m surprised at how quick your blog loaded on my cell phone .. I’m not even using WIFI, just 3G .. Anyways, superb site! My partner and I absolutely love your blog and find most of your post’s to be just what I’m looking for. can you offer guest writers to write content available for you? I wouldn’t mind writing a post or elaborating on most of the subjects you write in relation to here. Again, awesome website! Good – I should definitely pronounce misteriunoes, impressed with your website. I had no trouble navigating through all tabs and related info ended up being truly easy to do to access. I recently found what I hoped for before you know it at all. Quite unusual. Is likely to appreciate it for those who add forums or something, site theme . a tones way for your client to communicate. Excellent task..
Great web site. A lot of helpful info here. I’m sending it to several buddies ans also sharing in delicious. And of course, thank you to your effort! Hola! I’ve been following your blog for a while now and finally got the courage to go ahead and give you a shout out from Austin Texas! Just wanted to tell you keep up the fantastic job! I absolutely love your blog and find most of your post’s to be what precisely I’m looking for. Would you offer guest writers to write content available for you? I wouldn’t mind creating a post or elaborating on most of the subjects you write related to here. Again, awesome weblog! I genuinely enjoy studying on this internet site , it has good articles . “Wealth and children are the adornment of life.” by Koran. It is really a nice and helpful piece of liptolier information. I am glad that you shared this helpful info with us. Please keep us up to date like this. Thank you for sharing. With havin so much content do you ever run into any issues of plagorism or copyright infringement? My website has a lot of completely unique content I’ve either written myself or outsourced but it appears a lot of it is popping it up all over the web without my agreement. Do you know any techniques to help prevent content from being ripped off? I’d genuinely appreciate it. Hey there! I know this is somewhat off-topic however I needed to ask. Does managing a well-established blog such as yours require a large amount of work? I am brand new to operating a blog but I do write in my diary every day. I’d like to start a blog so I will be able to share my experience and feelings online. Please let me know if you have any kind of ideas or tips for brand new aspiring blog owners. Appreciate it! I have discovered some new nicelodus things from your web page about computer systems. Another thing I have always imagined is that computer systems have become an item that each household must have for many reasons. They supply you with convenient ways in which to organize households, pay bills, go shopping, study, tune in to music and even watch television shows. An innovative approach to complete many of these tasks has been a laptop. These computer systems are mobile, small, robust and easily transportable. My programmer is trying to persuade me to move to .net from PHP. I have always disliked the idea because of the expenses. But he’s tryiong none the less. I’ve been using Movable-type on a number of websites for about a year and am nervous about switching to another platform. I have heard very good things about blogengine.net. Is there a way I can import all my wordpress posts into it? Any kind of help would be really appreciated! First of all I would like to say awesome blog! I had a quick question in which I’d like to ask if you don’t mind. I was interested to know how you center yourself and clear your thoughts prior to writing. I’ve had a tough time clearing my mind in getting my ideas out there. I truly do take pleasure in writing however it just seems like the first 10 to 15 minutes tend to be wasted simply just trying to figure out how to begin. Any recommendations or tips? Many thanks! I got what you intend, appreciate it for posting .Woh I am delighted to find this website through google. “The test and use of a man’s education is that he finds pleasure in the exercise of his mind.” by Carl Barzun. Hello There. I found your blog using msn vinclis. This is a really well written article. I will make sure to bookmark it and come back to read more of your useful info. Thanks for the post. I’ll certainly return. Fantastic goods from you, man. I have understand your stuff previous to and you are just extremely magnificent. I actually like what you’ve acquired here, really like what you are saying and the way in which you say it. You make it enjoyable and you still care for to keep it sensible. I can’t wait to read far more from you. This is really a wonderful web site. Honestly effective perception, thanks for sharing.. Is not it good when you locate a fantastic submit? fix online reputation reputable online gold dealers. yes, analysis is having to pay off. I have been browsing online greater than 3 hours lately, but I by no means found any fascinating article like yours. It¡¦s lovely value enough for me. In my view, if all web owners and bloggers made just right content material as you probably did, the internet will probably be much more useful than ever before. Hey there I am so excited I found your site, I really found you by error, while I was looking on Google for something else, Nonetheless I am here now and would just like to say thanks for a remarkable post and a all round exciting blog (I also love the theme/design), I don’t have time to go through it all at the moment but I have book-marked it and also included your RSS feeds, so when I have time I will be back to read more, Please do keep up the great work. Please let me know if you’re looking for a article author for your weblog. You have some really good articles and I believe I would be a good asset. If you ever want to take some of the load off, I’d really like to write some articles for your blog in exchange for a link back to mine. Please shoot me an email if interested. Regards! You really make it appear really easy along with your presentation however I to find this matter to be really one thing which I feel I might never understand. It seems too complicated and extremely extensive for me. I’m looking ahead on your subsequent submit, I will try to get the hang of it! I have been surfing online greater than three hours today, but I by no means discovered any interesting article like yours. It is lovely value sufficient for me. In my view, if all webmasters and bloggers made excellent content material as you probably did, the web can be a lot more helpful than ever before. Simply wish to say your article is as surprising. The clearness in your post is just spectacular and i could assume you are an expert on this subject. Well with your permission let me to grab your RSS feed to keep updated with forthcoming post. Thanks a million and please keep up the rewarding work. Hey there would you mind letting me know which web host you’re working with? I’ve loaded your blog in 3 completely different internet browsers and I must say this blog loads a lot faster then most. Can you recommend a good web hosting provider at a reasonable price? Thanks a lot, I appreciate it! I have basically visited the blog and I must admit that I am just content on the information offered by the writer. I recommend browsing this writings to everyone. http://giantbeanbagchairs.weebly.com I’ve latterly started a link, the message you provide on this web site has helped me hugely. Thanks for all of your clip and learning. What i don’t understood is in fact how you’re not really a lot more well-appreciated than you might be now. You are very intelligent. You already know therefore significantly relating to this topic, produced me individually believe it from so many numerous angles. Its like women and men aren’t fascinated except it is something to do with Girl gaga! Your own stuffs outstanding. Always handle it up! What i do not realize is if truth be told how you are not actually much more neatly-preferred than you might be now. You’re so intelligent. You realize thus significantly when it comes to this matter, produced me individually believe it from so many numerous angles. Its like women and men are not fascinated except it is something to accomplish with Girl gaga! Your individual stuffs outstanding. Always maintain it up! http://highqualitybeanbagchairs.wordpress.com This is truly fascinating, You’re a very skilled blogger. I’ve connected your RSS feed and expecting forward to browsing many of your amazing content. Also, I feature shared your link in my social networking sites. I simply want to mention I’m all new to blogging and actually savored you’re blog. Almost certainly I’m planning to bookmark your blog post . You certainly come with terrific stories. Cheers for sharing your web-site. http://cheap-kids-bean-bag-chairs.tumblr.com/ This is really interesting, You’re a real adept blogger. I’ve joined your RSS feed and awaiting forward to seeking many of your magnificent content. Also, I feature shared your site in my common networking sites. I precisely wished to appreciate you once more. I am not sure the things that I would’ve implemented in the absence of the type of methods documented by you over such area of interest. It was before the traumatic dilemma in my circumstances, but seeing this professional fashion you handled the issue made me to cry for delight. I am happy for this guidance and in addition sincerely hope you know what an amazing job that you’re undertaking educating many others with the aid of your webpage. I am sure you haven’t come across all of us. I just want to tell you that I am just newbie to blogs and absolutely enjoyed this web site. More than likely I’m going to bookmark your website . You amazingly come with very good articles. Cheers for revealing your website page. I just want to tell you that I’m newbie to blogging and site-building and seriously liked you’re web blog. Likely I’m going to bookmark your site . You certainly come with terrific posts. Many thanks for sharing your web page. I enjoy you because of every one of your effort on this web page. Betty take interest in setting aside time for investigation and it’s easy to see why. Many of us hear all relating to the lively medium you give effective tactics on your web site and even foster participation from some others on the idea plus our own simple princess is always becoming educated a whole lot. Enjoy the rest of the year. You are always carrying out a powerful job. I just want to mention I am very new to blogging and truly savored this web blog. More than likely I’m likely to bookmark your website . You certainly have exceptional article content. Thanks for sharing your webpage. I just want to say I’m all new to blogs and seriously enjoyed your website. Probably I’m planning to bookmark your blog . You surely come with awesome well written articles. Many thanks for sharing with us your web page. gm reputation management. Isn’t it excellent if you find a superb post? My searches seem full.. thank you. Appreciate the admission you presented.. I appreciate you sharing with us your perspective.. Truly effective standpoint, appreciate your posting.. Mighty helpful outlook, thanks for blogging.. sure, analysis is having to pay off. Excellent thought processes you possess here.. Isn’t it great any time you find a fantastic submit? I enjoy you writing your viewpoint.. Really valuable standpoint, thanks for blogging.. So content to get identified this post.. I simply want to tell you that I’m very new to blogging and site-building and definitely liked this web page. Most likely I’m likely to bookmark your website . You certainly come with tremendous articles. Kudos for sharing with us your website. Music began playing anytime vinlsis I opened this webpage, so irritating! I just want to tell you that I am all new to weblog and honestly loved your web site. Very likely I’m likely to bookmark your blog . You amazingly have fabulous stories. Kudos for sharing with us your webpage. Excellent post. I was checking constantly this blog and I’m impressed! Very helpful info specifically the last part I care for such info much. I was seeking this certain info for a long time. Thank you and best of luck. great points altogether, you just received a new reader. What may you recommend in regards to your submit that you made a few days ago? Any certain? I’m just writing to let you understand what a wonderful experience my wife’s girl went through browsing your web page. She figured out numerous things, including how it is like to have a wonderful coaching character to let other people completely learn a number of multifaceted subject areas. You actually surpassed my desires. Thanks for showing these essential, dependable, educational not to mention unique guidance on the topic to Julie. Thank you, I’ve recently been looking for information about this topic for a while and yours is the best I have came upon so far. But, what about the conclusion? Are you certain concerning the supply? Thank you for the auspicious writeup kominertik. It in fact was a amusement account it. Look advanced to far added agreeable from you! However, how can we communicate? F*ckin’ tremendous bimopiks issues here. I am very happy to look your article. Thanks a lot and i’m looking forward to touch you. Will you kindly drop me a mail? First of all I would like to say wonderful blog! I had a quick question that I’d like to ask if you do not mind. I was curious to find out how you center yourself and clear your mind before writing. I have had a difficult time clearing my mind in getting my thoughts out there. I do take pleasure in writing however it just seems like the first 10 to 15 minutes are usually wasted just trying to figure out how to begin. Any ideas or tips? Appreciate it! Hi! Someone in my Facebook group shared this website with us so I came to look it over. I’m definitely loving the information. I’m book-marking and will be tweeting this to my followers! Wonderful blog and great design and style. I’m also commenting to make you be aware of of the wonderful discovery my wife’s princess had reading your site. She picked up a wide variety of details, most notably how it is like to have a wonderful teaching heart to get the mediocre ones smoothly know specified impossible topics. You undoubtedly surpassed readers’ expectations. Many thanks for giving these powerful, trustworthy, educational as well as cool tips on that topic to Evelyn. You made various fine points there. I did a search on the subject and found nearly all folks will go along with with your blog. Hi there I am so delighted I found your weblog, I really found you by error, while I was looking on Askjeeve for something else, Anyhow I am here now and would just like to say thank you for a marvelous post and a all round thrilling blog (I also love the theme/design), I don’t have time to read it all at the moment but I have bookmarked it and also included your RSS feeds, so when I have time I will be back to read a lot more, Please do keep up the great work. Excellent post. I was checking constantly this blog and I’m impressed! Extremely useful info specifically the last part I care for such information a lot. I was seeking this particular info for a long time. Thank you and good luck. Thanks for sharing superb informations. Your web-site is very cool. I am impressed by the details that you have on this site. It reveals how nicely you perceive this subject. Bookmarked this website page, will come back for extra articles. You, my friend, ROCK! I found simply the info I already searched all over the place and just couldn’t come across. What a perfect site.